Royal Air Force Charitable Trust Enterprises - News: Royal Jordanian Falcons Confirm Attendance! 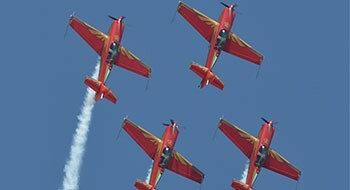 Home » The Airshow » Visiting the Show » Latest News » News: Royal Jordanian Falcons Confirm Attendance! Royal Jordanian Falcons Confirm Attendance! We're delighted that once again we will be joined by the Royal Jordanian Falcons at the Air Tattoo! A delight with crowds in 2018, the fantastic display team will thrill crowds at RAF Fairford with their display. The team performs around the world, acting not only as an ambassador for Jordan but also demonstrating the country's aviation expertise. Originally flying three Pitts S-2A Specials, the team changed to four fast and nimble Walter Extra-300 L aircraft in 2007. Since 2018, the team have brand new Extra 300LX aircraft, a more modern and capable version of the Extra design. The Royal Jordanian Falcons joins the Swiss Hornet and the Spanish Navy's Harrier 'jump jet' as the third confirmed aircraft for the 2019 Air Tattoo, held on 19-21 July at RAF Fairford.